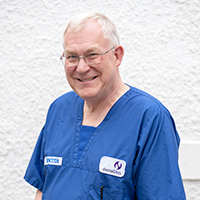 He is a past president and board member of the European Veterinary Dental College and also served two terms as president of the British Veterinary Dental Association from 1991 to 1995. He is a past board member of the Academy of Veterinary Dentistry. He served as a director (2003 - 2009) and chairman (2007-2009) of VETTrust - a veterinary charity dedicated to providing help with providing continuing education resources to needy individuals.